SOLE AGENT! 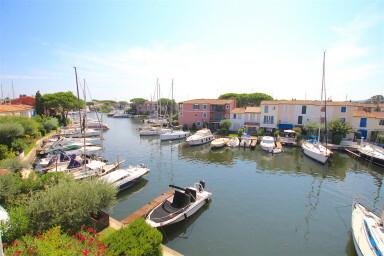 This bright fisherman house is located in a residential area close to the facilities. There is a barrier at the entrance of the street to keep the relaxing stillness of the area. Come into the house and you will immediately notice how bright it is both in summer time and in winter. On the ground floor, a living-room with a fire place, a kitchen and guest toilets. On the 1st floor, 2 bedrooms -including one with a balcony-, a bathroom and separate toilets. On the canal side, a terrace with bushes on both sides to keep your comfort. A 12m x 4,34m mooring in front of the house. A pretty house for holidays at the coast.